My friend Lauren over at Celiac Teen has done something incredible, and I want to make sure you all know about it. Lauren has gathered recipes from over 70 food bloggers (including me!) 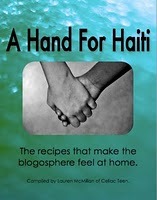 around the theme of "home" and compiled them into an e-book to benefit earthquake-ravaged Haiti. All proceeds will go straight to the Canadian Red Cross, who will distribute them appropriately where needed. I'll let Lauren do most of the explaining, but please consider purchasing the book (it's downloadable, in pdf format). To get more information, to purchase the e-book, or just to tell Lauren how awesome she is, head over to Celiac Teen.